Glamorous show-business events are great for spotting ultra-high-end jewelry, like the 200 carats of Harry Winston diamonds recently worn by Jennifer Lopez at the Golden Globes. But I swear that the place to see the most exciting fine jewelry is at Jewelers of America’s GEM Awards — “the Academy Awards of the fine jewelry industry” — which took place at New York City’s Cipriani 42nd Street on January 8. 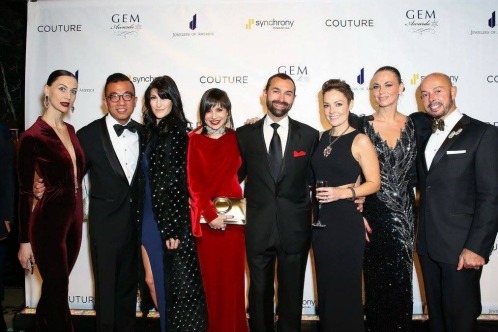 Per the Jewelers of America website, the GEM Awards “honors the achievements of individuals and companies whose work raises the visibility of fine jewelry and watches.” In other words, the venue is packed with people who make a living from jewelry and they go ALL! OUT! when it comes to adorning themselves for the event. If a trend is bubbling up, you can expect to see it first at the GEM Awards. People there don’t need to play it safe by sticking to diamond studs — well, maybe some of the men wear diamond studs! The men also wear diamond brooches and diamond watches. As for the women, there’s no such thing as too many, too big or too nontraditional. I’ve been watching chokers and collar necklaces make a comeback, so I got out a pearl and diamond choker I’ve had for years. I wore it with my Empress Wu dragon earrings and turquoise-and-ruby skull ring, along with whatever else I could fit on me. At any jewelry event, one has to be prepared to be temporarily stripped of all of one’s baubles, because people will demand to try them on. Can you imagine that happening at the show-business Academy Awards? “Give me your ring, Angelina. I want to see how it looks on me.” Actually, that type of behavior can’t be completely ruled out. 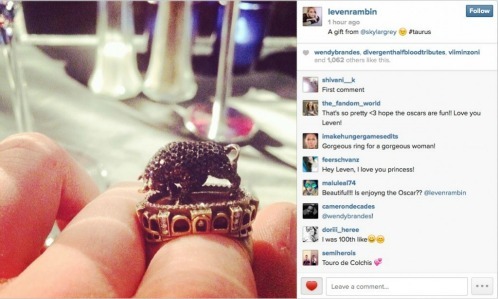 A couple of years ago, singer/songwriter Skylar Grey wore my Bull and Bullfighter Maneater ring to Elton John’s Oscar party, and everyone at her table tried it on. I’m still pretty confident that try-ons don’t happen among the celebs as much as they do among the jewelry people, particularly when armed security guards are lurking near the actors. Meanwhile, at one point at the GEM Awards, all my rings were on other people’s fingers! Bernadette Mack, from the Women’s Jewelry Association, modeled my platinum, full-finger barbed wire ring. I can always count on Craig Selimotic Danforth from the Gemological Institute of America to show up and give me his best pinky-ring pose. This time, he was joined by Ben Smithee of Luxe Intelligence, who coveted my engagement ring. Barbara Palumbo of Adornmentality and I were too busy posing for one of our traditional duckface selfies to swap jewelry. We outdid ourselves on our first try this time. Barbara threw herself into a lot of jewelry-related activity over the course of a few days in New York. You can read about her adventures here. In addition to seeing old friends such as Peggy Jo Donahue, Jennifer Heebner and Cindy Edelstein, I made some new ones, including Ben’s pal, the HIGH!LARIOUS! Houstonian Magen Pastor. My conversation with fellow jewelry designer Marla Aaron flowed easily, thanks to her familiarity with my blog. She might know more about me than I know about myself. Marla was worried I would think she was a stalker, but I was like, “This is great. I don’t have to explain anything.” I’m not that good at small talk anyway! I want to get an interview with Marla on the blog in the near-ish future, so you all can find out more about her, and she can have the weird experience of reading about herself here. At last year’s GEM Awards, I wore a velvet Zang Toi dress that I described as “Marsala.” This year, I wore a different shade of red velvet. I hadn’t worn this dress in years because I never knew what to do with that shoulder drapery. The one or two times I previously wore it, I tried to fling the draped piece over my shoulder like a scarf or pin it with a brooch. It never looked right, but I wasn’t sure that piece was supposed to hang straight down like a bib either. Last summer, while rummaging through my closet, I tried on the dress to prove to myself that it was time to let it go. Instead, I put it on and thought, “This dress is GORGEOUS!” I loved the color and the cut-out back. I figured the draped shoulder piece was meant to fall wherever it wanted to. It looked a lot better that way than any of the other options I thought of. Photo Credit: Sam/BFA.com. From left: Helena Krodel Wegweiser, Ben Smithee, Magen Pastor, me, Craig Selimotic Danforth, Bernadette Mack, Barbara Palumbo and Michael O’Connor. I got this dress at a consignment store, and never looked for a label in it until today, when I found a tag that read “Lemington Ridley.” There’s not much about Lemington online, but apparently he is now a costume designer and a dancer. In 2005, he showed ready-to-wear collections during New York’s fashion weeks. I had guessed that I got my red dress in 2004, but I was off. While I don’t see my exact dress in the photos of Lemington’s Fall 2005 collection, I’m positive that the red velvet in this look is the same fabric as my dress. Courtesy Fashion Ledge. Click for source. It really is true that you can have a great career in a creative field without being in a department store … dancing on Broadway … signed to a major music label … starring in a big Hollywood movie … or playing a prestige role on a cult Netflix or HBO show. Things like that are the high-visibility opportunities that people outside your particular industry might perceive as the only path to success, but, as I keep pointing out, fame and fortune are too entirely different things. I’m excited that Lemington found the right niche for himself, and now I’m going to stalk him on Facebook to see if he would like to tell me more of his story. What an unexpected outcome from my attendance at the GEM Awards! That red dress fits like Lemington cut it just for you. Gorgeous! And I love seeing your pieces passed around and tried on.